A game of football was played last night that changed the game forever, a game of football for the purists, a game that captivated a nation. It took 44 young, brave women, the dreams they shared, and 25 000 agape and amazed fans to take football into a whole new stratosphere. I watched Carlton’s Brianna Davey and Nat Exon wade furiously into the contest, belted from pillar to post, tackled and slung about, only to emerge with the Sherrin in hand and a gleam in the eye. I watched Darcy Vescio, a graphic designer for her Blues, shine, grabbing the footy and twisting brilliantly away, contorting and twirling about her hapless opponents, slotting one, two, three, four brilliant goals. I watched as Bianca Jakobsson, a tower of navy, snatched mark after mark after mark in the last term, a colossus, swatting aside those Magpie underlings that dared enter her airspace. I found comparisons for these brilliant young woman in the men’s league, and realised that wouldn’t be right. The cry will not be “Cyyyril!” or “Edddddie!”, it will be a delighted exclamation of “Veeeeeeeesss-cio! !” from the terraces. Mo Hope was held goalless as the Blues swarmed like a famished pack of hyenas upon a unknowing pocket of impala. Brianna Davey’s unquenchable hunger at the coalface, ably aided by captain Lauren Arnell, Nat Exon and Lauren Brazalle, cleared Collingwood’s midfielders with frightening efficiency. A wall of navy blue amassed across the back flanks, allowing Hope and her brethren no breathing space. It was a clinical performance. Masterful. Collingwood’s Sarah D’Arcy worked hard all night, throwing as many punches she could at the inescapable Carlton clutches, while Celia McIntosh, Amelia Barden and Australian cricketer Jess Cameron battled hard. They kicked one first quarter goal, the Pies, and were allowed simply nothing else from then on. A bench of six was reduced to two as Collingwood crumbled under a ferocious onslaught of navy blue and white. Players were flung each and every way from the contest, hurled bodily into Princes Park’s turf. They rose again, and again, diving selflessly into congestion. I found myself clapping and smiling and shaking my head as the final siren sounded, grinning like a maniac, joyful. My mother rose, bade me goodnight, and tottered to bed as happy as I’ve seen her after a game of football. In winter, this game would end with an emotion explosion, having fluctuated wildly all night long, to end in victorious chorus or in gut-wrenching defeat. She’d spent the night as enthusiastic as I’d ever seen her, and had booted our battered old pigskin about in the backyard, a mischievous gleam in her eye. 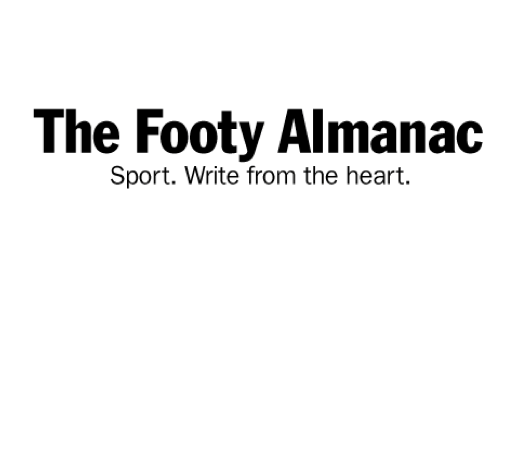 “There needs to be an old woman football league,” she says, booting the Sherrin away. As for barrcking, well I did not barrack for Collingwood nor the Blues. I barracked, wholeheartedly, for the game laid out under my eyes. And as I awaited the Sherrin outside, in the gathering twilight, an arm slung around my brother’s chest and eyes focused upon the pigskin, I thought not of my yellow & black heroes, nor of Marcus Bontempelli or Lance Franklin. I imagined myself as Darcy Vescio. And I flew for that ball. Carlton: Davey, Vescio, Arnell, Jakobsson, Exon. Collingwood: D’Arcy, Barden, Cameron, McIntosh. Lauren Arnell (Carlton) 1, Darcy Vescio (Carlton) 2, Brianna Davey (Carlton) 3. The AFL have done plenty wrong over the journey, but on the whole they should be applauded for instituting the Women’s League. Sure, there have been mis-steps, but on last night’s evidence it was a fine start to the new league. Lovely account, Paddy. I think there were many who ‘barracked for the game’ as you so beautifully describe it. Weren’t we lucky to be there! I too barracked for the game, and it was a winner. Wonderful Paddy. So well written and expressed. We witnessed a wonderous night and amazing football . Well done. Great piece. I also loved your line ” I barracked, wholeheartedly, for the game laid out under my eyes.” I think a lot of others did too, which is quite a rare thing in club-based/tribal sport, and was fantastic to experience. Tess – we would love her at Tigerland! It’s all about hope at the moment. For a 15 y.o., you are very perceptive -& have considerable literary panache. Like you & others have said, I also suspect many Carlton v Coll. observers were simply “barracking for the game”-and/or barracking for women’s sport in general. I am curious ( assuming you might know several girls in the 12-18 age group, school acquaintances etc) & would like to make this request, if it is not too much of an imposition. Could you ascertain from sporty girls whether all the publicity about the AFLW might convince many of them to try Australian football -& why? If not, why not? And a similar question to girls not currently playing any sport? Torp – will inquire tomorrow, but from what I know of at the moment there are about five or six girls I know of who are playing for the Gisborne Rookies Girls team up here. There’s also a team up at Kyneton I believe. It’s really exploded in the last few years. Great to see. She had me yelling it by night’s end.